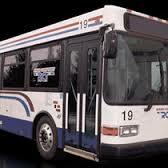 • RCT Plus Senior Shopping Service--"Grocery Shuttle"
New to Public Transit? Not understanding how it works, can be overwhelming as a first time rider! CLICK HERE for important information on how Richland County Transit works.